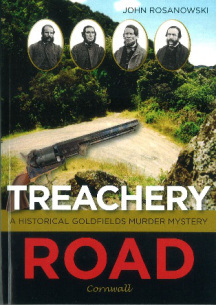 Treachery Road examines the infamous exploits of the Burgess-Kelly gang which marauded the goldfields in the 1860s. It seeks to crack one of New Zealand's noted "cold cases". Who actually carried out the six murders attributed to the gang? A gentleman with an alcohol problem is in Sea View Lunatic Asylum on the hills above the Hokitika goldfields. He has been making a nuisance of himself in Hokitika and other gold mining areas, trying to gather information about the infamous Burgess Gang: Richard Burgess, Philip Levy, Thomas Kelly and Joseph Sullivan. The man is obsessed with the case, Burgess, Kelly and Levy having been hanged years before. As an ex-journalist (hence the alcohol problem) he has stumbled across information that makes him doubt the evidence of Sullivan – the fourth member of the gang – evidence that was used to convict the other three. Once he realises he will be held in the asylum until he can prove his ravings about the case have a logical and fact-based foundation, he sets about to record his research and his findings. Not a straight forwards task when: “The reader should be aware … that members of the criminal classes can be consummate liars”. The Maungatapu Murders are a well-known incident in New Zealand history, with four men and a horse killed on their way to Nelson from Canvastown, and another man, an old whaler who had been working as a farm labourer, killed while travelling from Pelorus. The murders took place in 1866. In “these more enlightened days of the 1890s”, the ex-journalist intends to find the truth about the case using the methods of his hero, Sherlock Holmes. He uses his two volumes of Conan Doyle’s stories as his text book, and he writes to journalist colleagues and friends to assist him in gathering information – much as Holmes sends out his Baker Street Irregulars. There is always a challenge when presenting large amounts of historical detail in a novel. Making the job easier for Rosanowski is the fascinating material he is working with – he peppers his story with the actual press clippings from the day, and matches their phrasing in his own writing. The framing of the ‘author’ of the story being in Sea View is also a great idea, as the possibility of unreliability hovers around him, and when he finally faces his drinking problem, he is spurred to be even more logical and scrupulous. The only small complaint I had with the style was the footnotes, most of which I found unnecessary. Knowing the bare bones of the story, it was really amazing to read how the justice system connived to get Burgess, Kelly, and Levy convicted, the role the media played in determining the outcome of the trial, the pressure from the public who had decided the ‘facts’ – especially when the people concerned didn’t behave as they ‘should’ – and the story of guilt became self-perpetuating, for example when the new field of phrenology was enlisted to support the verdicts, folding all the prejudices and anti-Semitic sentiment into pseudo-scientific jargon. I was reminded of Steve Braunias’ The Scene of the Crime, a non-fiction books making the same disturbing points (minus the phrenology) about well-known current cases. Rosanowski does a great job of laying out all the information, and the description of the executions is genuinely moving, with the despair of Kelly, the bluster of Burgess, and the resignation of Levy as they face their deaths. Well done too is the following of Sullivan through to his death in 1881- wandering unwanted and shunned wherever he went. Treachery Road hovers nicely between fiction and non-fiction. And brings to life a period of history through the details of a murder case that has always captured the public imagination.